My massively-behind-schedule darkroom project is still progressing and is now at the point where I'm just about able to start making prints. Bizarrely, I seem to have thrown out some essential items such as print tongs, safelights and small measuring jugs (big ones, too). I'm not sure why I did this as it was always my intention to get a darkroom up and running at some point and I've held onto other stuff including enlarging lenses and 12x16 print trays. Oh well. I'll no doubt be able to pick them up on Ebay. I'd built up a backlog of unprocessed films over the last few years and I've spent the last week or two developing them. It took a couple of attempts before I started to feel comfortable with the process but I'm "back in the groove" now and it's becoming second nature again. The developing tank I use is a big Paterson affair that takes five 35mm spools. Developing film can be quite time consuming so it's better to be five times as productive and do a batch all at once rather than spend more or less the same time developing one film. 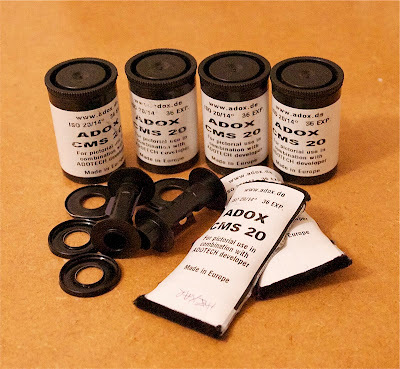 A few of the rolls were Tri-X rated at 1260 ISO and destined, when I shot them, to be developed in two-bath Diafine. I found this combination to be a match made in heaven when I last used it a number of years ago. The trouble this time was that Diafine isn't the easiest developer to find in the UK and I didn't fancy buying a new pack just to develop a couple of old rolls the contents of which were a complete mystery to me, so long ago did I use them. Lurking under the stairs, however, were the brown glass bottles that I kept the Diafine in and it transpired that I never actually drained them. The date I mixed it up - November, 2006 - was written on the labels. Could five year old Diafine still work? Only one way to find out. I've read about some people using Diafine that was up to three years old but I can't remember anyone being daft enough to use five-year-old brew. As it turned out, it wasn't daft at all. Diafine's legendary keeping qualities are well-earned as the half-decade old developer produced perfectly normal looking negs. I was gobsmacked, to say the least, even if the images on the rolls looked less than inspiring from a creative point of view. The pic at the top of this post is of a small batch of Adox CMS 20 that I developed using the recommended Adotech developer. The results are very fine grained as you'd imagine but there is very little lee-way when it comes to the highlights, even using the Adox developer. I've mixed my own two-bath developer along the lines of the Barry Thornton recipe and that's what I'll be using for my black and white films from now on. I might mix up some more with half the recommended amount of metol in the first bath to make it very soft working to test whether it's capable of taming CMS 20. Two-bath is the best developer I've used when it comes to ease of use, consistency and tone control. It's not necessary to be bang on with the temperature of the developer or the development time so it's just about impossible to go wrong. There are, not surprisingly, two developers, A and B. The film is immersed in bath A for four minutes with agitation every minute. This causes it to become saturated with developer although little development actually takes place because the chemical that really kicks the process off is in the second bath. Bath B doesn't get any agitation where 120 roll film is concerned and just one inversion half way through the four minute development time for 35mm. What happens is that the developer in the second bath quickly becomes exhausted where it has to do a lot of work, i.e. developing the highlights, almost guaranteeing that they will not become too blocked up and unprintable. The shadow areas, however, where the developer has less work to do, just keep on developing throughout the four minutes. 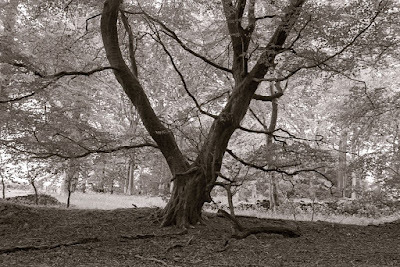 The result is nicely graded negs which are fine-grained, sharp and very easy to print. With no or very little agitation required during the second four minutes, I use this free time to mix up a stop bath and prepare the fixer and water rinses that I give the films after fixing. I wash the films using the Ilford recommended technique: fill the tank and given it ten inversions, drain and refill for twenty inversions and again for forty inversions. I normally do another 40 inversion stint to be on the safe side. 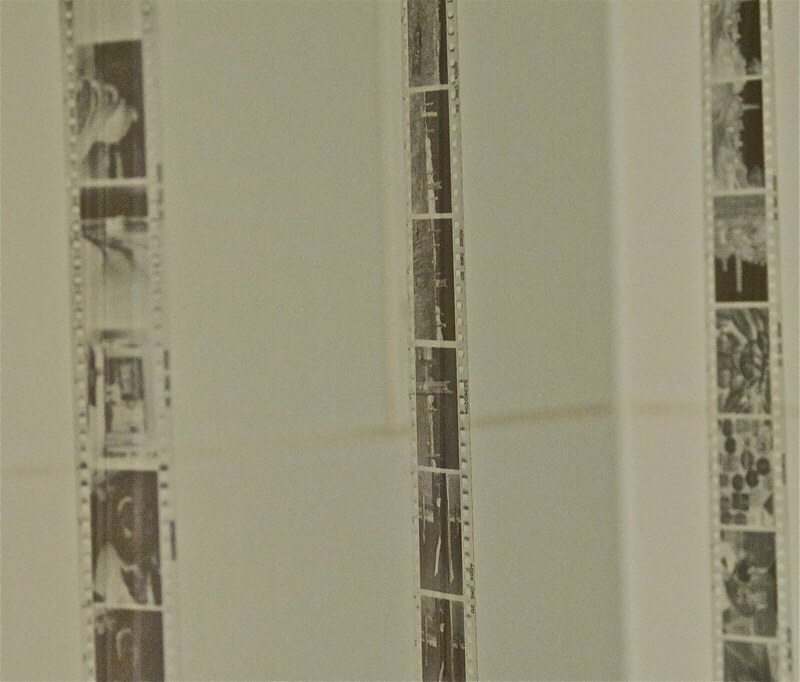 As the second pic shows, I dry the films in the shower. Run it for a few minutes so that the water droplets pull the dust out of the air, wait for the moisture to clear and then hang the films up. I used to use a rubber squeegee to remove the surplus water from the film but I seem to have thrown that out as well! Just now I'm using a new chamois leather cloth which does the job almost as well although it's vital to keep it clean in between films to avoid scratches. I had intended to scan some of the negs for posting but my computer set up was completely rejigged recently and I can't seem to reinstall the scanner software. Anyway, the whole point about negatives is that they're designed for the darkroom and not some half-arsed digital compromise! I like and use 2 bath developers for much the same reasons as you & they are cheap & I can brew them myself. I don't bother with agitation. In the first bath the emulsion is just soaking up the developer. There seems to me to be no need to agitate as not much is happening and moving fresh developer into contact with the emulsion is, well, not necessary. For the second bath I invert the tank once after two minutes to sweep away the debris produced by the development. I may be wrong headed but it produces nice negs. The one thing that puzzles me is the capacity of diafine. I mix up a gallon and use a liter as a working solution, topping it up from the other three liters. It takes forever to use up a gallon. It just goes on an on. The B solution is something else. It gets really nasty after 20 or so equivalent rolls; however, it still works. Any thoughts? I usually agitate bath A half way through it's alloted time just to ensure the emulsion gets a good, even soaking and don't agitate bath B at all apart from a few inversions right at the start. I've never been bothered with streaking with 120 roll film but haven't developed much in the way of 35mm film this way so wouldn't like to recommend it. The only sure thing in photography is to stick with whatever works for you. Diafine is something else. I've never seen anything like it but it's not always easy to get hold of in the UK. If I wasn't mixing my own, though, I'd be using Diafine. Bit late but Matt who runs Ag Photographic carries both sizes of Diafine. Thanks for that Andy. Next time I'm getting some Diafine I'll definitely give Ag a shout.